Milan and I harvested these carrots last week. Last year was our first year growing carrots and I love them! Not only are they fun to harvest and beautiful to look at, they are so incredibly sweet! My carrot seed for this spring arrived in today's mail. I can't wait! Sign up for our Farmshare program to get your share of these sweet beauties! I decided recently that over the last ten years I (unknowingly) became an egg snob. Shortly after getting married I acquired my first laying hens. At first I simply no longer needed to buy eggs from the store. Before long though I made a conscious decision that I WOULD not buy eggs from the store. Not because I thought mine were better but because of the feeling of independence that came with the knowledge that I no longer needed to rely on the grocery store. (It wasn't long before this feeling transferred to veggies as well). About the time my eyes opened to organic methods of farming I became aware of the ethical issues surrounding store bought eggs. Sweat-shop chickens, factory farmed, whether in cages or loose, housed with 20,000 other birds was no way to ethically produce eggs in my mind. The longer I kept chickens, learning their ways of life, the more convinced I became that we would in no way support conventional laying methods. 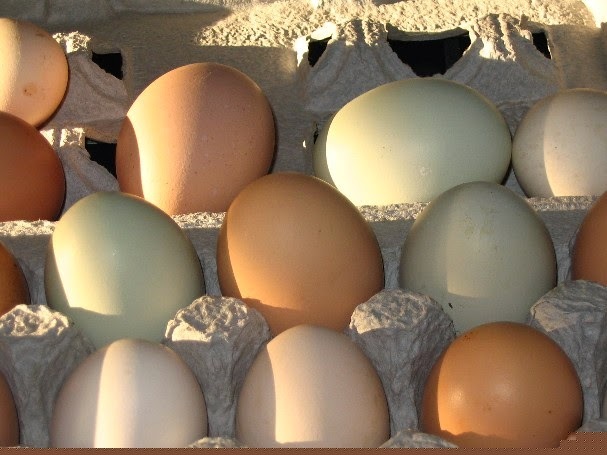 I first sold our eggs several years before we started growing vegetables. Several years before I ever thought I would farm for a living. I had about 20 laying hens and Robert would take my eggs with him to work at the Corps of Engineers weekly and dole them out to his faithful co-workers for $1 a dozen. That makes me laugh now. And I'm reminded of this every time we are driving out in the country and see a sign at the end of a driveway offering "Fresh Eggs $2/doz". I wasn't in the business to make money off my eggs. I thought I was paying for my chicken feed. Years later, after meticulous spreadsheets have become the norm, I have to laugh. But I wasn't keeping chickens to make money. I was keeping chickens because I love having a laying flock. I love the cooing and the cackling and watching them scratch the dirt. I love that every day is like an Easter egg hunt around here. Although, fortunately, due to their current living conditions, I don't have to hunt any further than a laying box these days. I'm proud that over the years there has become such a high demand for our eggs. 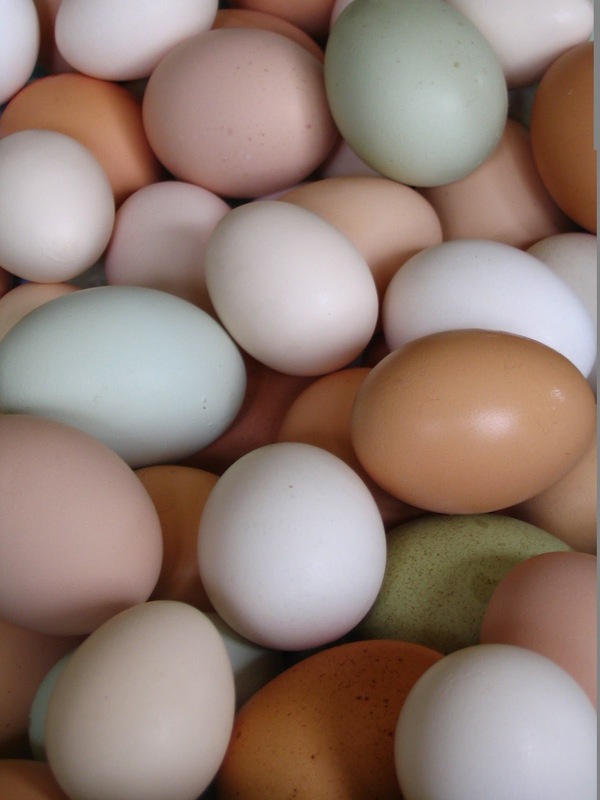 I hear people at market tell me how much better our eggs are than store bought eggs. I just smile and nod my head because I know that our eggs have stiff orange yolks and they are ridiculously fresh compared to store bought eggs but in the back of my mind I kind of shrugged my shoulders at the notion that they really tasted much different. Fast forward to the last two weeks where while we were traveling for the holidays I ate store bought eggs on three different occasions. Having been so far removed from sweat-shop eggs, I now understand what my customers have been telling me for years. There is a difference between our eggs and store bought eggs. Our eggs are AWESOME. Not only is there an ethical difference in the way they are produced, there is a difference in how fresh they are, there is a difference in the way they look and there is a difference in the way they taste. And if you've never seen our eggs before, oh my gosh. They.Are.Beautiful. If you are in our area, I urge you to sign up for our Eggshare program. This is a 10-week program we are running in conjunction with our Farmshare. I realize though that this is only 10 weeks out of the year. We are working on the logistics of running the Eggshare even when the Farmshare is out of season. If you aren't near us, find a farmer or a backyard chicken keeper near you. Whether you realize it or not, they are all over the place, it just takes a little work to find one. And if this topic interests you, stick around...soon to post a bit about egg economics on a small farm.